The latest update allows guilds to battle one another for bragging rights and potential rewards. Cut the Rope developer ZeptoLab has released a major new update for its multiplayer strategy title King of Thieves. Since launching on iOS in February 2015, the game has been downloaded more than 10 million times (it released on Android a few weeks later), and is played by more than six million unique gamers each month, worldwide. 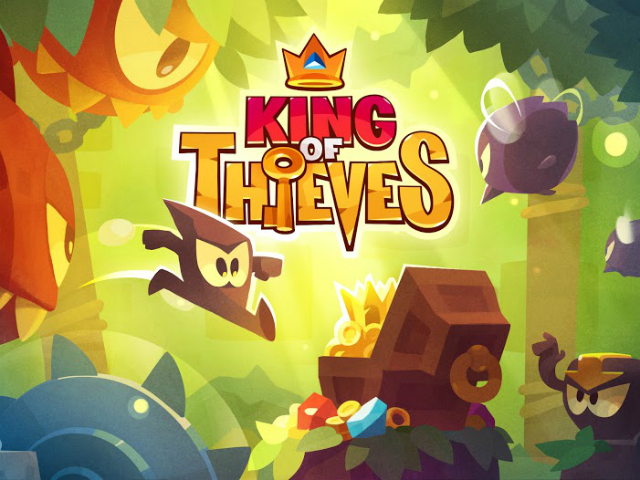 In King of Thieves, players construct a series of bases and defenses to keep out intruders through a take on platforming and tower defense gameplay. Users also invade other bases to earn precious jewels. With this update, players can access guild battles, in which two guilds with similar ratings will be pitted against each other in a timed competition. These battles last for three days, and the guild which steals the most gems during that time is declared the winner. In addition, the most active players of the winning guild will receive bonus in-game currency. Players were able to join guilds in previous versions of King of Thieves as well, but now this feature truly opens its potential and offers some new and exciting possibilities. The Guild Battles update is only the beginning! This guild battles update is one of many tweaks and additions ZeptoLab has made to the game since its release. For instance, the original game required players to lose their defensive shields when attacking other players, but this is no longer necessary, giving players more freedom to attack others without facing potential attacks themselves. Parts of the game have also been rebalanced and tuned, in an effort to eliminate “unbeatable” dungeons. King of Thieves is available to download for free on the iTunes App Store and Google Play.